Design has been at the forefront of W Hotels since the opening of the David Rockwell-designed W New York – the first ever W Hotel. W Hong Kong - the first W to open in China - are equally concerned with quintessential W aesthetics, offering a sensory mix of the contemporary against the heritage of traditional Chinese culture. 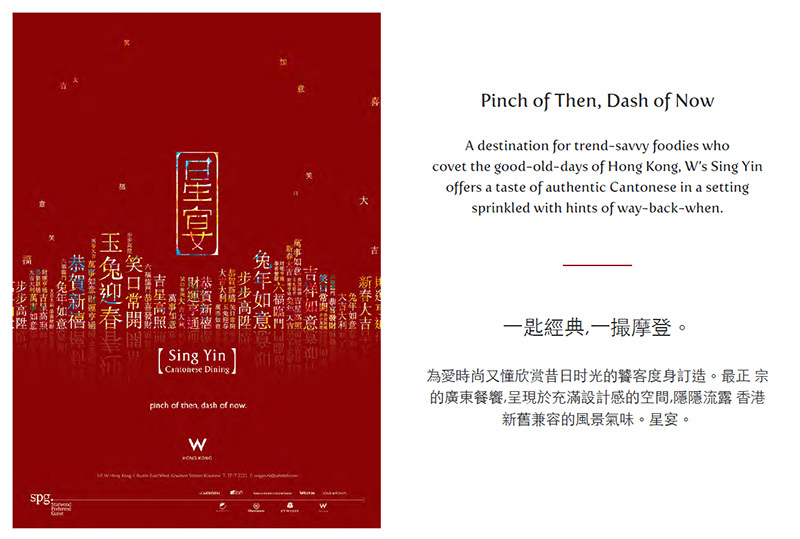 When coming up with a restaurant name, and ad copies for the hotel's glamorous Chinese restaurant - brainchild of world-renowned architect and interior designer Steve Leung - Straight is naturally mindful of the relevant language bound together by W's DNA as well as Leung's glamorous style reflecting Hong Kong's rich past and its vibrant, high voltage cityscape.